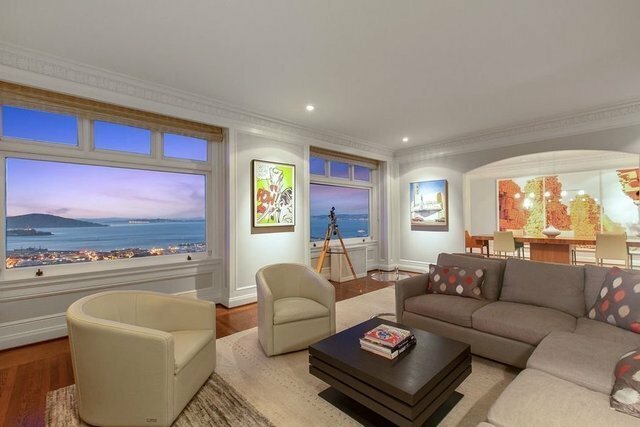 Grand scale and spectacular views in all directions from this dramatic, full-floor residence on Russian Hill's most coveted cul-de-sac. Private vestibule and elegant gallery foyer leads to a show-stopping expanse of windows with breathtaking views. Living room with fireplace, formal dining room, eat in kitchen with marble countertops and top of the line appliances. Gallery hallway, perfect for art display, leads to expansive Master suite with sunroom/sitting area and beautiful views of Downtown and Salesforce Tower. En suite master bath with spa tub, double sinks and stall shower. Generous 2nd bedroom with ensuite bath; 3rd bedroom or den with half bath and laundry. Resident manager. One car parking and storage.